The Watkins ProLift IV is designed specifically for use on Hot Springs, Caldera, Tiger River and LimeLight hot tubs using their original style cover with metal bracket plates built into the sides. 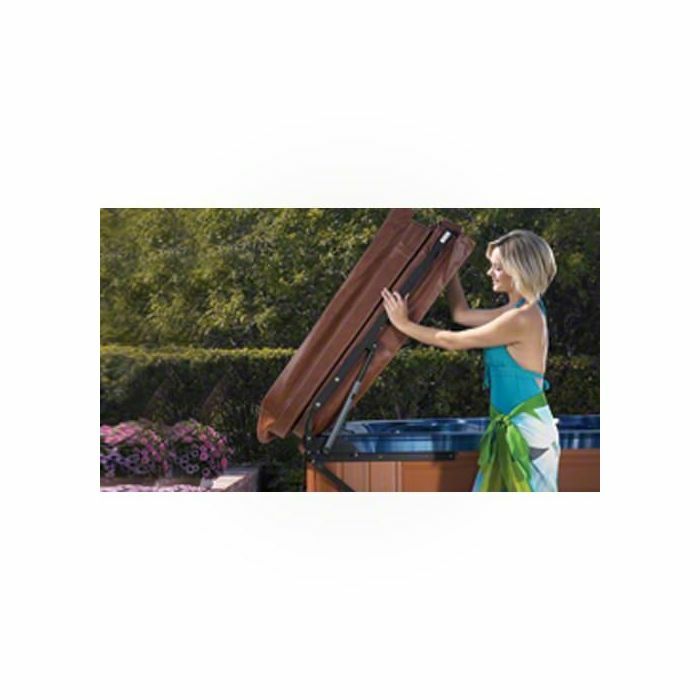 A spa cover lifter is an essential part of the Caldera Spas experience. With the leverage and design provided by a lift system, nearly anyone (even a single person) can fold the cover back to easily and quickly move it out of the way. And who wants to wrestle and strain against a cover before getting in a hot tub to relax? Designed exclusively for Caldera Spas, the ProLift Spa Cover Lifter Systems give you easy access to your spa and minimize wear and tear on your spa cover. For hot tub decks, gazebos or other areas where clearance is limited, the ProLift IV allows you to position the cover vertically, just behind the spa. Requires only 7" clearance. The Watkins ProLift IV is designed specifically for use on Hot Springs, Caldera, Tiger River and LimeLight hot tubs using their original style cover with metal bracket plates built into the sides. The lift will not work with an aftermarket hot tub cover that wasn't designed specifically for use with ProLifts. https://www.sparmax.no/lokklofter-lifter-prolift-iv-caldera-76066?___store=default 1467 LIFTER, PROLIFT IV Caldera (lokkløfter), 76066 https://www.sparmax.no/media/catalog/product/7/6/76066-2-2.jpg 3790 3790 NOK InStock /Utendørs boblebad/Tilbehør til boblebad The Watkins ProLift IV is designed specifically for use on Hot Springs, Caldera, Tiger River and LimeLight hot tubs using their original style cover with metal bracket plates built into the sides.